Valentine's Day is such a fun holiday. My minnies are always so excited about making Valentines for their classmates and I've been thinking about what to do for a few days. This is an easy craft that is cute. Here's the prototype of what the girls will give to their friends this year. I'm waiting on a personalized stamp so that the girls can stamp their "Happy Valentine's Day, xoxo Natalia and Alexia" on the inside flap. All of the decoration on the outside is easily made using different punches from Stampin' Up. Last night, the girls helped me punch out some hearts and circles. We're making about 60 of these, so it's good that we start early! I like it that these are easy enough for the girls to help. I love handmade Valentines! This is a great treat for a special Valentine! It's just a king size Hershey bar covered with some embellishments. I kept the original Hershey wrapper and used it as a foundation for the other layers of paper. Again, punches and my new cricut make the task easy and relatively fast. How do you decorate for Valentine's Day? 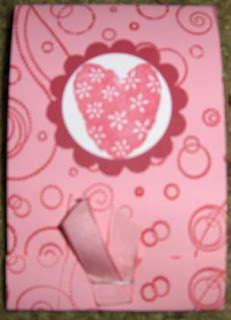 Do you have little people at home who take Valentines to school? What will they put in their little mailboxes this year? I'd love to hear your ideas! On another note, I'm thrilled that I almost have 100 followers! I'm so happy to learn about my followers and appreciate you reading the blog. Please tell your friends to follow my blog and keep reading. 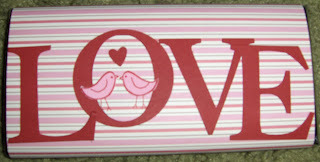 Lots of exciting things are in the works including a fantastic Lilly Pulitzer giveaway when I reach my 100th follower. Be sure to enter the LA Plates giveaway if you have not already done so. Remember that you can earn extra entries by sharing this giveaway on twitter or facebook using the "Share it" button on the upper right hand side of the blog. Be sure to send me a reply if you tweet the giveaway to @ilovelillymd. Thanks for participating and good luck! Love your valentines! You have inspired me to make something for my little ones. 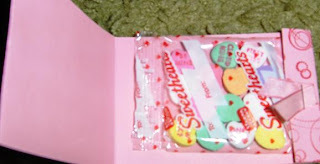 Where did you get the little bag of coversation hearts? Those are perfect! Oh how I lovvve that Hershey bar. Any chance you'd make me one? Those are adorable! They're going to have the cutest valentines at school! Great Hershey bar idea! I may do that for my students this year... but only print out the label... woe is me. I want a Cricut!